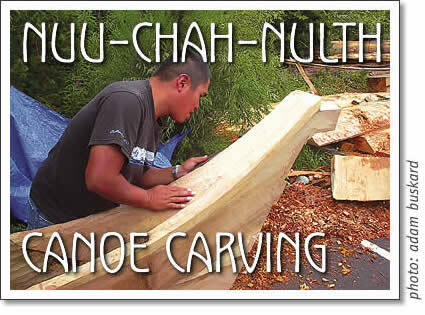 Traditional Nuu-chah-nulth red cedar canoe carving can be witnessed monday to friday at the Tin Wis Resort in Tofino. Karl and Bill Martin are teaching a group of youth the ancient art and invite all to come witness. The Nuu-chah-nulth developed a style of canoe that had a low stern, a flat bottom, and rounded sides that made it easier to cut through ocean waves. The design and sturdiness of the Nuu-chah-nulth canoe made it one of the finest ocean-going canoes made by native peoples anywhere. The Nuu-chah-nulth canoes were as highly valued by other First Nation tribes because of their stability in the ocean. They were often used for hunting sea mammals such as porpoises, sea otter, and whales. They were traded as far south as the Oregon coast. Tofino Event:Traditional Nuu-Chah-Nulth canoe carving by First Nations carvers Karl and Bill Martin at the Tin Wis Resort in Tofino.